This RF termination covers the DC-3000 MHz frequency range. It provides 50 watts average input power at +25oC and 25 watts at +70oC, and 1000 watts peak power (1 microsecond pulse). 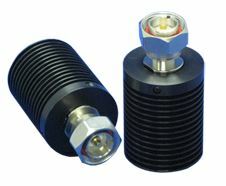 The 50T-566 7/16 M RF termination is weatherproof and has specifically designed for outdoor 4G/LTE site applications. If offers 50 Ohms (nominal) impedance, 1.15:1 (maximum) VSWR, and a -55oC to +100oC operating temperature range. For additional information on specifications, download the datasheet.